Last Sunday, 15th February 2015, the mood for a kopi-o gao came upon me. So I traipsed to one of my favourite uncle baristas in Telok Blangah. I was surprised. 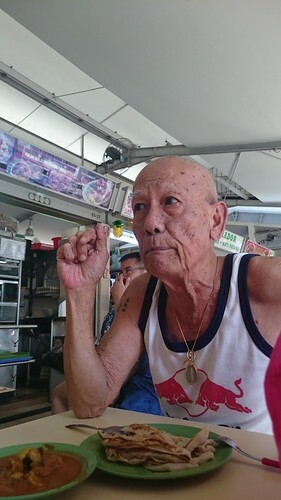 This elderly Chinese gentleman with tattoos on both his upper arms spoke in perfectly enunciated English. Judge me not but I thought he looked “Hokkien Gangsterish” if you know what I mean. I said, “Go ahead”, and motioned for him to sit down. My curiosity was piqued. We were sitting at a table right opposite a fruit juice stall and next to it, a prata stall. Understanding that I was open to engagement, he turned towards me. His English was clipped. I noticed his crucifix and Mother Mary pendants. I attended St. Patrick’s School as a teenager. I’m a proud Patrician. And I know Patricians. There is a certain je ne sais quoi about Patricians. You see, Patricians possess a counter-intuitive blend of gangster and gentleman, streetwise and refined, rough and smooth. Ask any Patrician and they’ll understand what I mean. This gentleman had it. I asked him if he was from a mission school. He said yes. I asked which. He said St. Patrick’s. I was vindicated. OK, let me nutshell what I learned of Clarence during our chance encounter. He completed both primary and secondary school in St. Patrick’s (they had primary school until 1957 when the primary section of the school was separated and became Saint Stephen’s School, which I attended). He graduated in 1957 (I enrolled in 1977). Being a bit of a rascal (which is the norm for Patricians), he was publicly caned (rather proudly, I must add) a number of times. 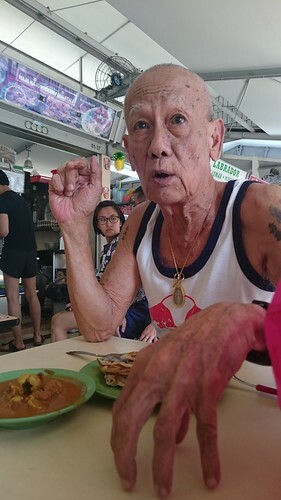 One time he was caned for “waylaying” Katong Convent (KC) girls (he remembers the names of the three girls but I’m not publishing it). He said this rather proudly although he admitted that at that time he had no idea what “waylay” meant. I totally get it that he was proud (as will most Patricians). Clarence got caned another time for stealing a papaya at a nearby hotel (now demolished). Although the property was protected with barbed wires, he threw a gunnysack over the wires, climbed over and stole the papaya. He was caught when he made his way back to school. He claimed that the papaya had fallen on the public side of the fence. It was a lie. And the disciplinarian didn’t buy it. Updated on 20 February 2015 with the information of the name of the hotel – Ocean Park Hotel (thanks Larry Henson). Clarence described the experience of one of his public canings. The caning teacher presented a row canes the day before the public caning and ask him to choose one. He chose the seemingly most insipid one. On the following day of public caning, he wore two shorts and stuffed it with newspapers. Although the caner knew what was going on by the sound as the cane struck Clarence’s derrière, he let it go. Compassion. I’m guessing that today, public caning is a no-no. When I was in St. Patrick’s from 1977 to 1980, public caning was still in force. I think it was and is a good thing for an all-boys school. Although I enrolled in St. Pat’s in 1977, twenty years after Clarence graduated, I asked him about some of the older teachers during my time. One of my vice-principals was Mr Eu Wing Kee. Clarence remembered him to be a trainee teacher during his time. He remembered Brother Justinian (an avid tennis player well into his advanced years) and Brother Joseph McNally (principal during my era). The principal during his time was Brother Alban. The St. Patrick School’s latin motto is Potest Qui Vult, which means “he can, who wills”. When I was at St. Pat’s (1977 – 1980) we would refer to our motto instead as “protest and revolt”. Apparently, it was the same during Clarence’s era. Perhaps even before. He was brought up in Lorong K, Telok Kurau with his Grandmother. I didn’t ask him about his mom and dad. 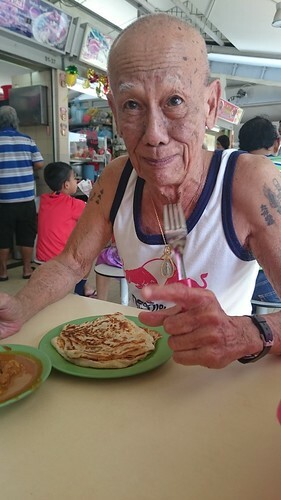 He earned money for his grandma by helping a Malay lady sell epok-epok, kueh-mueh and other delicacies. He would be paid ten cents a day for doing this, which was apparently a lot of money then. He would put this money into a “piggy-bank” his grandmother made from a coconut shell. He worked at the Port of Singapore Authority (PSA) but when he joined it was called Singapore Harbour Board (SHB). He canvassed for Lee Kuan Yew in Tanjong Pagar in the 1957 Singapore City Council Elections. Incidentally, he is not pro-ruling party. In fact, he’s not a fan, by any stretch of the imagination, of the current overcrowding he feels in Singapore. After hearing his story, I can definitely sympathise. I recognise that Clarence and his peers are the ones who built the Singapore that we now enjoy. A simpler, quieter, and slower Singapore. He’s got tattoos on both his upper arms in Chinese characters. I asked him about them. On the right side are the names of his mom and dad, and on the left the names of his wife and son. He is a Catholic and attends the Carmelite Monastery in Singapore. I left after half and hour as I had bought some raw produce from the wet market and needed to get home to refrigerate it. I didn’t get Clarence’s number but I told him I’m going to look out for him to hear his stories. I’m definitely going to look out for him to collect more stories. What a great Sunday tête-à-tête. I graduated in ’92 and during my time, public canning was still in force. It’s cool to be canned publicaly, gardening on Saturday was way way worse (but teachers did not know that). Excellent post DD. Gonna share it. Thank you Nick and thanks for sharing it. St Patrick’s Primary functioned till the middle 60s. The remaining primary classes were transferred to St Stephen’s sometime in 1965 or 1966. I was teaching in St Stephen’s then. I taught in St Stephen’s from 1964 to 1968. I had my education in St Patrick’s from 1953 to 1962. Yes Patricians are fiercely proud of St Patrick’s School. The hotel you mentioned was Ocean Park Hotel. I remember the boys going in the late evenings to the classrooms at the end nearer to the hotel to catch a glimpse of the female singers of the time. One of whom was the popular Malay singer Saloma. Thanks for that Larry. It seems you have loads of stories to share too. I look forward to hearing them some time! Thanks for pointing out Ocean Park Hotel too. Appreciate it loads. Nice story. And although i did not go to the schools (either St Pats or St Stephens), my son did….and I can see in him, the exact same qualities you describe of the Patricians !!! And, by the way, I’ve often noticed that Singaporeans of the same era as the Clarence you featured here, speak perfectly enunciated English ! While many of those in the couple of generations that followed, have somehow lost that command of English, and certainly lack grammatical skills…..Although its improved recently, its clear how our educational system failed us, even though we moved to a 100% English-medium school system several decades ago! Ha ha… yeah. We reproduce a certain mould of guys. Yes, the boys and girls of his era, especially those educated in mission schools speak very well indeed. Is N done with school yet? I’ve lost touch. The bigger N is in uni, that I know from ML. Oh wow. Time passes quick. Congrats though! Let’s do a beer some time. Same place. Yep, ML has rubbed off on your no-longer kids (fashion, work….) heh. Pl do go into FB and look up the FB page ThePatricianSociety. Am with the Patrician Society. Would be great to connect with u n Clarence !! Hey Felix! Nice to meet you. I don’t have Clarence’s contact but if I bump into him at the hawker centre again, will get it. How do I join the Patrician Society?